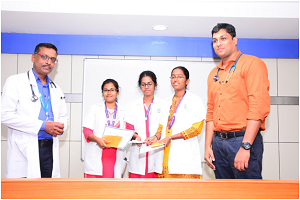 Intra-collegiate quiz for undergraduate MBBS was organized on 25th March 2019 from 2 pm to 3 pm. 45 participants had registered for the preliminary rounds which were conducted earlier on 23rd March and four teams of three members each was selected for the final rounds. The quiz was conducted by Dr.Kamaludeen, Senior Resident and the postgraduates of the Department of Pulmonary Medicine. The topics of the quiz rounds were focused on the RNTCP Updates. The winners were awarded cash prizes and certificates. 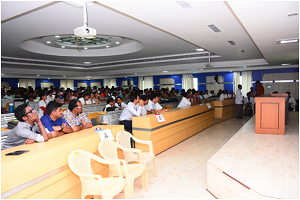 The event was appreciated by the undergraduate students who had participated in large numbers. Participation certificates were given to all registered students. Each year, we observe World TB Day on March 24. This annual event commemorates the date in 1882 when Dr. Robert Koch announced his discovery of Mycobacterium tuberculosis, the bacillus that causes tuberculosis (TB).World TB Day is a day to educate the public about the impact of TB around the world. Unfortunately, the current and next generations fail to recognize the face of the great scientist who is considered the father of Mycobacteriology! In order to honor the great soul and to make the public recognize his importance, the Department of Pulmonary Medicine crafted a 3D Portrait using rice grains. This artwork was performed by Mr. Kumar, Senior Artist from the Medical Education Unit of Sri Balaji Vidyapeeth. 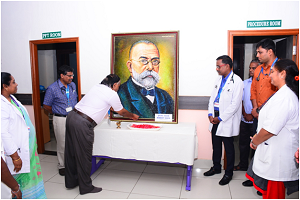 The portrait has been installed in the OPD premises of the Department of Pulmonary Medicine – Ground Floor D Block and was unveiled by Dr.Lakshmanaperumal, RMO in the presence of RNTCP Core committee Members on 25th March 2019. The department is grateful to the management of MGMCRI for sponsoring the portrait. The Core Committee Meeting for the First Quarter 2019 was held along the sideline of the TB Day celebrations. The meeting was attended by the HODs of Microbiology, Community Medicine, Pediatrics, ICTC Coordinator, Nursing superintendent, Infection Control Nurse, and RNTCP Staff. 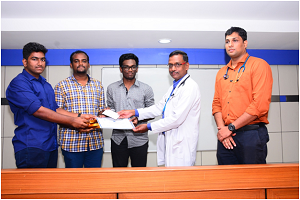 Felicitation of Patients who successfully completed treatment at MGMCRI DOTS Centre: Three patients who were diagnosed and started on ATT from the Department of Pulmonary Medicine and who had successfully completed the treatment as per advice were invited to the department on 25th March 2019 and were felicitated with gifts by Dr.Lakshmanaperumal, RMO. 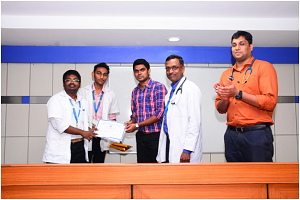 Lab Technician was felicitated with gifts during the event to appreciate their services to the programme. 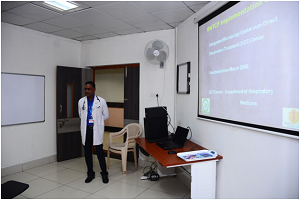 Dr.Pajanivel.R MGMCRI RNTCP coordinator made a presentation on the recent updates in RNTCP. The sensitization program was well received by the core committee members and was followed by interactions.